Water-quality and streamflow data collected in the Minnesota River Basin during 2000 -03 were examined and evaluated to determine the condition of 28 tributary streams and the Minnesota River mainstem with respect to concentrations, loads and yields of total suspended solids, total phosphorus, orthophosphorus, nitrate-nitrogen, pesticides, and bacteria. The data show widely varying water-quality conditions in most streams during a relatively short four-year monitoring period, underscoring the need for longer-term data gathering to gain an accurate perspective of water quality across a broad spectrum of hydrologic conditions. Results show that watershed yields of water-quality constituents follow a general pattern of increasing yield, often accompanied by increasing flow-weighted mean concentrations, from west-to-east across the Minnesota River Basin. The data indicate regional differences in the magnitude of constituent load response to water runoff. The difference in response is related to watershed soils, geology, topography, and stream morphology, but land use, cropping practices, drainage practices, and conservation practices also may be affecting the load response. Concentrations of total suspended solids, total phosphorus, orthophosphorus and nitrate-nitrogen in several of the monitored streams, despite reductions during 2003, frequently are at problematic levels, exceeding thresholds associated with reasonable expectations for water quality in their respective ecoregions. Affected streams range in size from minor tributaries to the Minnesota River mainstem. Impaired conditions were documented during widely varying hydrologic conditions ranging from near drought to flood. The data gathering, using consistent and technically-sound methodology at all sites across the Minnesota River Basin, serves to document present stream condition and provides a basis for directing resources to impaired streams. Such data, collected longer term, will form a solid body of evidence that accurately portrays stream water quality over time. These data will enhance the impaired waters listing process by providing an improved perspective of stream water quality during normal, above normal, and below normal runoff periods. During the four-year period, the monitoring data have served to identify impaired streams and have provided indications of source areas, but questions remain about specific contaminant sources, source mobilization, and transport mechanisms. The more complex mechanisms may require in-depth focused research studies beyond the scope of the present monitoring program and suggestions for research projects are presented in this report. The purpose of the 2003 State of the Minnesota River Report is to consolidate surface water quality monitoring information collected in the Minnesota River Basin for calendar years 2000 - 2003. This summary report assembles data collected by multiple agencies and organizations and presents the data in a fashion that allows for relative water quality comparisons between the mainstem Minnesota River sites, as well as between the major and minor tributaries in the Minnesota River Basin. 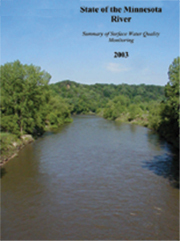 To date, three prior reports have been published in State of the Minnesota River Report series (2000, 2001 and 2002). The 2003 report presents 2003 monitoring data, and compares it with much of the 2000 - 2002 data along with a few additions and some minor corrections. The data and information presented in this report was gathered at 32 surface water quality monitoring stations located throughout the Minnesota River Basin. Preparation of this report is a joint venture of the Minnesota Department of Agriculture (MDA) Minnesota Pollution Control Agency (MPCA), and the Water Resources Center at Minnesota State University, Mankato. Greg Payne, hydrologist, joined the group for a second year and examined the data, provided in-depth analysis, and wrote major sections of the report. This report helps fulfill the overall mission of the Minnesota River Basin Data Center, which is to inventory, develop, retrieve, interpret, and disseminate information on topics that impact the environment, economy and communities within the Minnesota River Basin. This mission was articulated first by the Minnesota River Citizens Advisory Committee (CAC) in a series of recommendations to the MPCA (MPCA, 1994), and later by the Minnesota River Basin Joint Powers Board (MRBJPB). This report demonstrates that good coordination exists between state and local water quality monitoring agencies in the Minnesota River Basin. The information provided in this report is also consistent with and helps fulfill the “Monitoring Action Strategy” identified in the Minnesota River Basin Plan (MPCA, 2001). The plan was developed with extensive input from researchers and citizens and charts a course for the continued restoration of the Minnesota River. The goal of the Minnesota River Basin Plan is “To restore, protect and maintain the water quality, bio-diversity and the natural beauty of the Minnesota River or to make the Minnesota River fishable and swimmable once again” (MPCA, 2001). The Minnesota River originates at the Minnesota-South Dakota border, flows for 335 miles through some of the richest agricultural land in Minnesota, and joins the Mississippi River at Minneapolis/St. Paul. The river drains a basin of 16,770 square miles: 14,840 square miles in Minnesota, including all or parts of 37 counties; 1,610 square miles in South Dakota; and 320 square miles in North Dakota and Iowa combined. Minnesota’s portion of the Basin is primarily used for agriculture and represents 18.5% of the state’s land mass and 29% of its cultivated land. As the state’s largest tributary of the Mississippi River, the Minnesota River’s volume increases the Mississippi’s flow by 57% and adds disproportionately to its pollutant load (MPCA, 1997). The 1994 Minnesota River Assessment Project (MRAP), at the time the most comprehensive study of water quality in the Minnesota River Basin, concluded that the Minnesota River is impaired by excessive nutrient and sediment concentrations (MPCA, 1994). Since the publication of the MRAP report, several organizations throughout the Basin have taken responsibility for collecting additional data to better define tributary characteristics and learn more about how these tributaries affect the condition of the Minnesota River. In many parts of the Basin, this information is used to target implementation practices that reduce point and non-point source pollution, thereby improving the overall health of the Minnesota River. Local watershed projects are supported mainly by Federal 319 funds and Clean Water Partnership grants administered by the MPCA. Much of the remaining data presented in this summary report is provided through monitoring programs of the MDA and Metropolitan Council Environmental Services (MCES), with contributions from the United States Geological Survey (USGS), Minnesota Department of Natural Resources (MDNR) and the Minnesota State Climatology Office. In recent years, there have been significant improvements in point source pollution control as well as continued adoption of conservation and non-point source best management practices within the Minnesota River Basin. With these changes has come an increasing expectation that the monitoring data being collected will not only be used to identify potential problem areas but can also be used to document and quantify water quality improvements as best management practices are implemented. Recent publications have questioned the costs of implementation activities if the benefits cannot be readily quantified. As such, efforts like this to coordinate and standardize monitoring activities and information are becoming increasingly important to provide a scientifically defensible assessment of water quality responses to changes in land use throughout the Basin. This report is available on the Minnesota River Basin Data Center web site at http://mrbdc.mnsu.edu to allow wide access and an opportunity to review and comment on its content. The State of the Minnesota River report is available as a complete document or is available in sections as listed below. Netscape: Save to your computer's hard drive by holding the shift key down while clicking on the desired pdf file.